OTTAWA, ONTARIO--(Marketwire - Oct. 20, 2010) - Audio clips available at www.inspection.gc.ca/english/corpaffr/relations/indexaude.shtml. 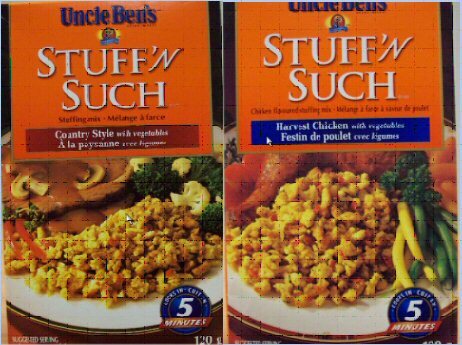 The Canadian Food Inspection Agency (CFIA) and Mars Canada Inc. are warning people with allergies to milk not to consume certain Uncle Ben's Stuff 'N Such stuffing mixes. The affected products contain milk which is not declared on the label. There has been one reported allergic reaction associated with the consumption of these products. Consumption of these products may cause a serious or life-threatening reaction in persons with allergies to milk. Mars Canada Inc, Bolton, ON, is voluntarily recalling the affected products from the marketplace. The CFIA is monitoring the effectiveness of the recall. For information on milk, one of the nine most common food allergens, visit the Food Allergens web page at: http://www.inspection.gc.ca/english/fssa/labeti/allerg/allerge.shtml. Photos of the products are available at the following address: http://media3.marketwire.com/docs/Stuffnsuch.jpg.